Looking to end his 2012 racing season on a high note, GT7 Motorsports pilot Anthony Gangi Jr. is set to take on the Superkarts! USA (SKUSA) SuperNationals this week in Las Vegas, Nevada. The 2012 United States Rotax Mini Max Champion will contest the ultra-competitive TaG Cadet class and will look to walk away the big winner. Showcasing his talent and knack for the temporary parking lot circuit at the Rio All Suite Hotel & Casino, located just off the famous Las Vegas Strip, Gangi Jr. enters as one of the favorites to take the title. 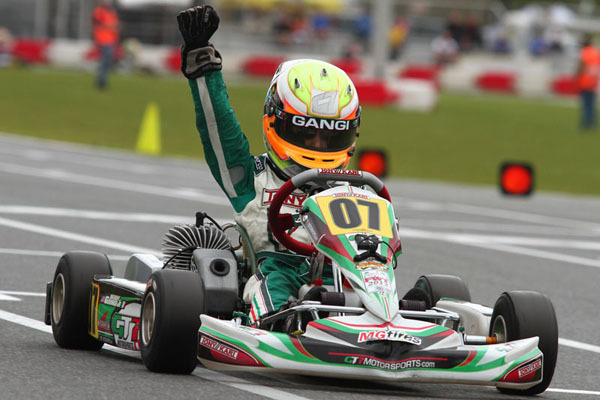 Gangi Jr.'s first go at the prestigious SuperNats win came in 2010, as the young driver showed his tenacity and sheer talent with a heat race win and Super Sunday pole position. Last year, Gangi Jr. also impressed as he earned the third place podium position in only his second ever SuperNationals event. Entering the 2012 edition of the biggest karting event of the year, Gangi Jr. will bring with him momentum from his second US Rotax Grand National title, which he earned back in August, as well as a more recent podium position in the challenging Yamaha Junior Sportsman Money Race during the Robopong 200. Named David Cole's #1 pick to win the TaG Cadet class as well as Rob Howden's #2 pick in the eKartingNews.com TaG Cadet preview article, Gangi Jr. has already been dubbed one of the drivers to beat. Combined with Gangi Jr.'s confidence and speed, his GT7 prepared Tony Kart package, and his strong results from previous SuperNats, this could be Gangi Jr.'s year to win big in Sin City. Gangi Jr. will take to the temporary layout starting Wednesday, November 14 for the first of two practice days, and will work to perfect his set up and learn the nuances of the .85-mile, 14-turn temporary circuit. Official racing action will commence Friday, November 16 with qualifying and the first of three heat races, with Saturday seeing the final two heats and last chance qualifiers. Gangi Jr. will then fight for the TaG Cadet win on Super Sunday to close out his 2012 karting season.